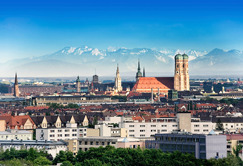 This photo of Munich is now posted on Demandware’s website. The Burlington company is establishing its European HQ there. Demandware Inc., a Burlington-based company that provides cloud services for online retailers, announced the opening of its new European headquarters in Munich, Germany and the appointment of Jamus Driscoll as general manager for its Europe, the Middle East, and Africa operations. The Munich office is now the center of operations for sales and marketing in EMEA, the company said in a press release. Demandware added that it recently expanded its offices in London and opened new offices in Lyngby, Denmark. It has existing offices in Paris and Jena, Germany. Demandware clients in Europe include such retailers as Butlers, Magasin du Nord, Marks & Spencer, Mothercare, and Playmobil. According to Demandware’s website, other clients include Adidas, Brooks Brothers, New Balance, and Kate Spade.